We’re losing sleep over Wonder Goblin’s exclusive releases for Designer Con. Wonder Goblin, and his candy colored nightmares will being sharing a booth (1251) with the prolific Candie Bolton, who’s bringing her own set of exclusives we’ll cover at a later date. Blaze it! The fan favorite Budfoot is getting 2 chilling releases. “Yeti Kush” is hand painted and flocked, while the regular “Yeti” is just hand painted with a gorgeous marbling on it’s skin. “Yeti Kush” will sell for $350 and “Yeti” will sell for $300. Both stand at a hefty 12 inches and will be limited to 7 pieces each. Making his debut is Windigo, Wonder Goblin’s newest figure. The “Night Tripper” Windigo stands at a massive 13 inches and is hand painted in Wonder Goblin’s signature black light reactive vinyl paint. Only 8 of these guys exist with 3 of them sporting dreadlocks. The Dreadlocked Windigos will sell for $350 while the regular ones will be $300. Fungoid Man is the twisted love child of Wonder Goblin and Skinner. The “Marbled Watermelon” Fungoid man is 8 inches tall, limited to 24 pieces and will sell for $150 each. This is the first soft vinyl release in the United States, so dont spore-get about it! We’re a happy family! The Hagopuss Family (Queen, Defender, and Baby) will be bundled in a set that includes a jaw dropping 20×14 inch giclée, of Wonder Goblin’s original oil painting. Limited to 7 sets, the Hagopuss family will sell for $450! 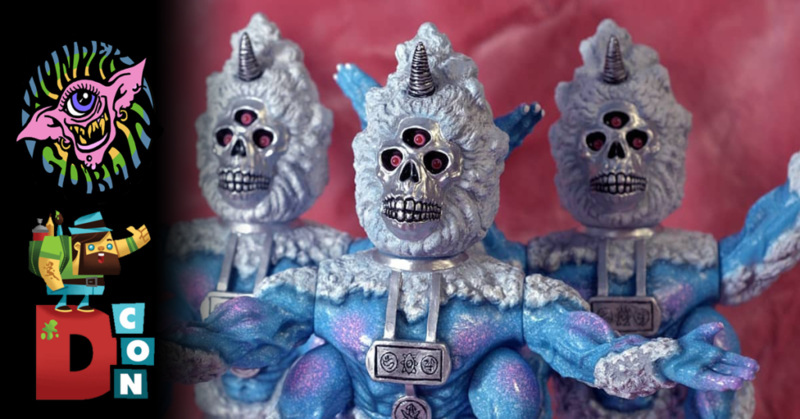 Speaking of Candie Bolton, Wonder Goblin also teased a Snow Bake Kujira custom for Designer Con that’s limited to only 2 pieces! You can follow Wonder Goblin’s colorful and hauntingly whimsical art on his Instagram or his website. If you haven’t purchased your Designer Con tickets yet, what are you waiting for? Hop to it!